Cushman & Wakefield (C&W) announced on Feb 2 that it has been appointed as the exclusive marketing agent for the sale of a JTC detached food factory at 2 Enterprise Road. Located adjacent to the future Enterprise MRT Station (Jurong Region Line), the JTC detached food factory sits prominently on a regular land plot at the corner of Jalan Boon Lay and Enterprise Road. It is located within the JTC “Chin Bee” Food Zone surrounded by other key food suppliers/manufacturers such as Neo Garden, Khong Guan, GSK, Unilever, Olam and Meiji. The JTC detached food factory is a single-storey industrial building with two levels of modern office. Currently, the approved use for the JTC detached food factory includes warehousing and distribution of food and related products and meat processing. Facilities within the building include warehouse (aircon / non-aircon), production area, chiller rooms, freezer rooms and multiple loading bays. It has a land area of approximately 16,234.2 sq m with gross floor area of approximately 14,084.7 sqm. The food factory has a JTC leasehold tenure of 60 years commencing from 16 December 1972 (balance of approximately 14 years). Under the Master Plan 2014, the site is zoned as “Business 2” with a plot ratio of 2.5. The JTC detached food factory is being put up for sale by private treaty at a guide price of $18 million, and will be delivered on a vacant possession basis. 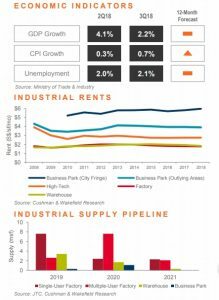 In its 4th Quarter Industrial Snapshot, C&W noted that the manufacturing growth in Singapore is moderating. “Singapore’s overall economic growth moderated to 2.2% y-o-y in 3Q2018, with growth in the manufacturing sector also slowing to 3.5% y-o-y. Future manufacturing growth will continue to ease as the November manufacturing PMI declined by 0.4 to 51.5, while the electronics PMI became contractionary after falling by 0.6 to 49.9. The temporary trade truce between US and China may boost market confidence, with hopes that a trade deal can be sealed in early-2019. In any case, Singapore may not be too negatively impacted if no deal is reached. A recent study by MTI found that the value added from US-China bilateral exports only comprised 1.29% of Singapore’s GDP in 2017. 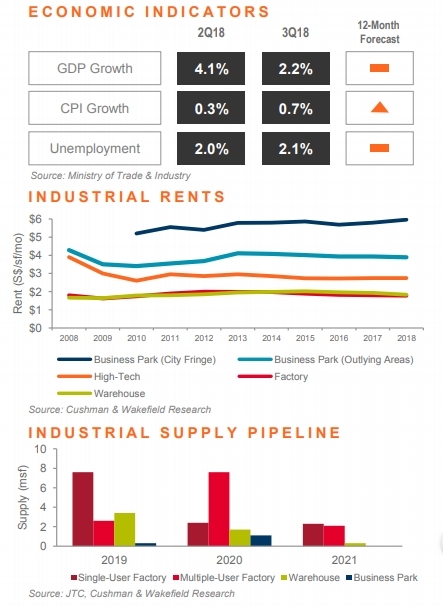 Industrial rents stagnated during 2018 due to the supply overhang from the preceding years. In 2019, the tapering of supply will lend support to the market and lead to marginal increases in rents despite the slowdown in manufacturing growth. 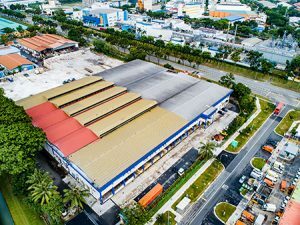 The sale of the JTC detached food factory comes at a time when the industrial property market is steadily improving in health. This improvement in the industrial property market comes at the back of a strong pick-up in leasing transactions to a record high. This has likely been underpinned by the more upbeat business sentiment alongside the positive economic and manufacturing data, which has emboldened more tenants and industrialists to review their real estate options.